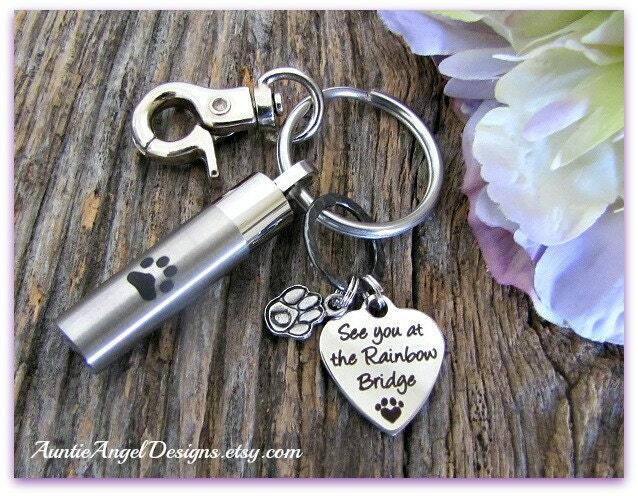 This pet sympathy keychain is crafted from a quality stainless steel cylinder cremation urn pendant with a stainless steel heart charm which reads "See you at the Rainbow Bridge," and a sweet one-sided stamped pewter monogram paw print charm. This beautiful pet memorial keepsake urn is used to cherish a small amount of your beloved pet's cremated remains or a small lock of fur, burial soil, or crushed flowers. 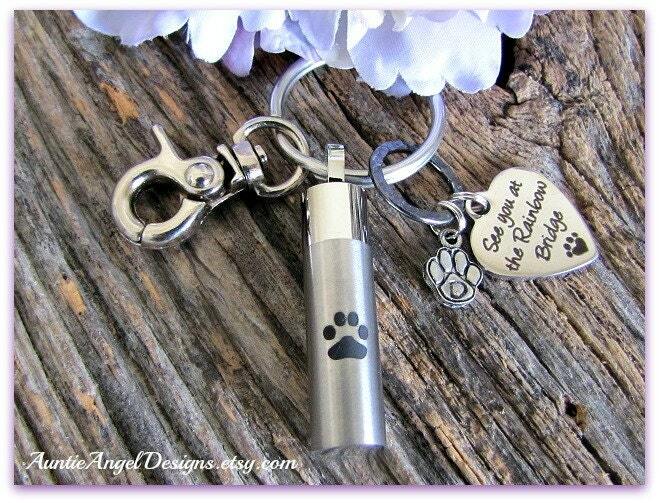 I include a funnel kit so that you may transfer a small amount of your pet's precious cremains or fur, etc., through the screw top of the pendant. Your keychain arrives beautifully gift-boxed and ready for gift giving. 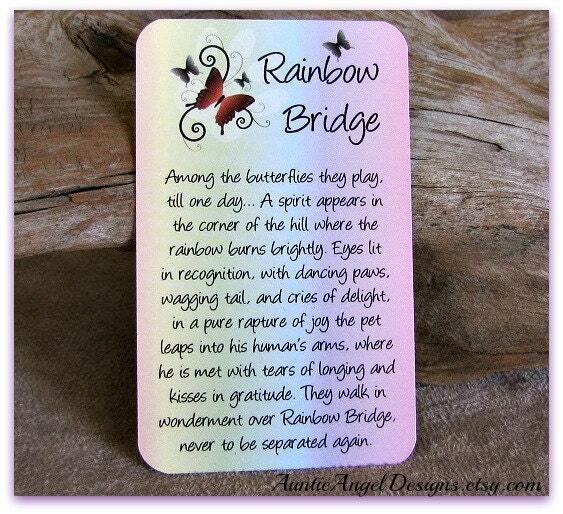 As part of your purchase, I include my own version of an adorable Rainbow Bridge-themed memorial wallet-sized keepsake card (pictured). 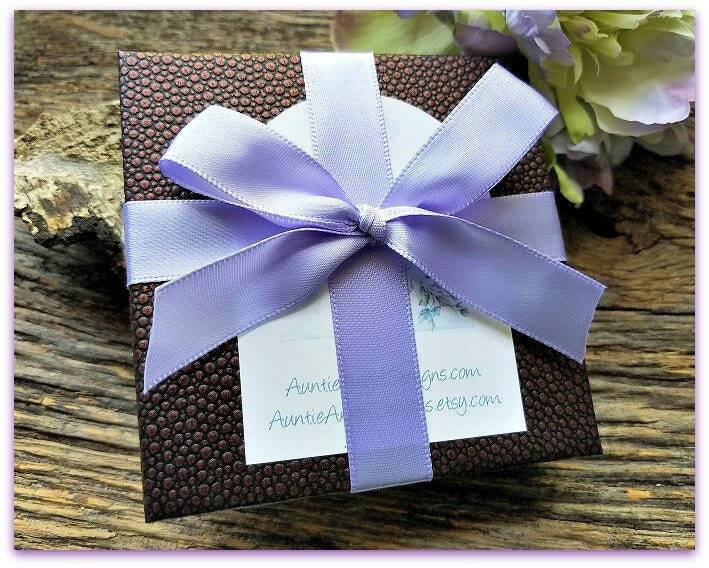 I also enclose a blank paw print gift enclosure card and envelope for you to write your heartfelt message if you are sending this gift directly. Visit my sister Etsy shop for more remembrance gifts at www.inlovingmemoryofyou.etsy.com.